Thermal expansion and contraction of the entire mass. Easy removal and replacement of pavers. For example, temporary access to piping, replacement due to damage, or changing to other colors to create a pattern. Prevent loss from wind or water that weakens the installation. Prevent weed and grass growth. Prevent sand being tracked into buildings and damaging floor finishes. Instead of another operation using a type of glue that is added to the joint sand, a better and less costly effect is achieved by simply using one of the Aldon solvent based penetrating sealers shown below. This example is with clay brick - "common type". However, the discussion applies to all pavers. 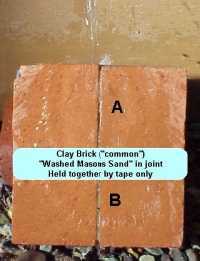 For purposes of this demonstration two brick were taped together with small spacers to create the joint gap. The gap was then packed with the same sand used for paver installations. Unlike typical paver installations, no vibration was used. Therefore, the sand was less stable and more of a worst case scenario. Note gloss next to the joint from the higher solids "Porous Stone Sealer". 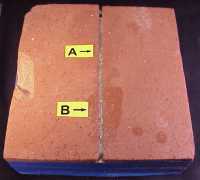 After curing, the brick were tipped up and placed under running water to simulate heavy and continuous water erosion. 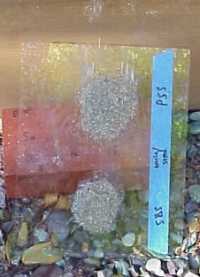 "B" - "Porous Stone Sealer"
There was no loss of sand from either half after one hour. Two piles of sand were placed on a piece of glass. "S-B-S Sealer" was poured on one pile and "Porous Stone Sealer" on the other. Result: sand is firmly glued together and bonded to the glass. The glass was tipped up and placed under continuously running water. No sand removed from either pile, even after one hour.